It was very calm last night apart from 0400 to about 0530 when we copped a little side chop when the wind changed from westerly to southerly. We get up at 0730 and Michael takes Veto to the beach. We have breakfast and just before 0900 we head to the beach to go for a walk. On the way we drop off a USB stick with photos of Amica so they can download them and also upload some they took of us yesterday. 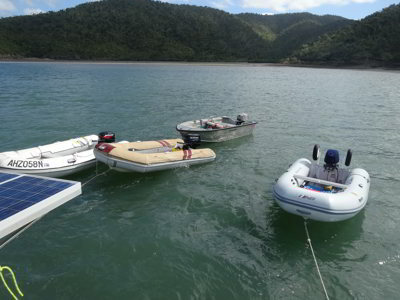 As the tides here are so large, at the moment about 4 metres difference between high and low, we have to be careful where we anchor or we will end up high and dry and never able to get the dinghy back in the water. After dropping Kelly and Veto on the beach, Michael anchors in about 2.5 metres or more and swims to shore. We then head off for the walk. 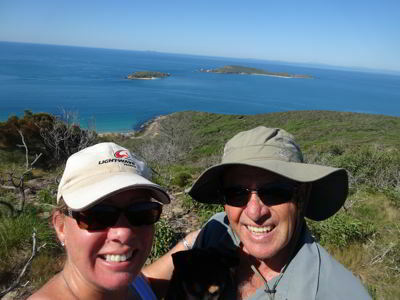 Our plan is to walk to at least the first lookout, then see how that has been and maybe go to Mount Wyndham, the highest point on Great Keppel Island. 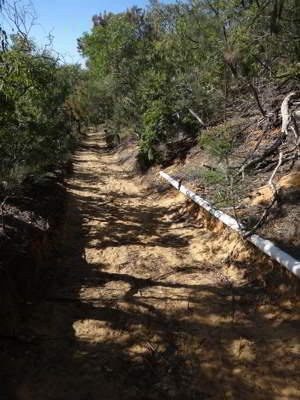 The track is a mixture of sandy walkways, an old tar road and a dirt track. 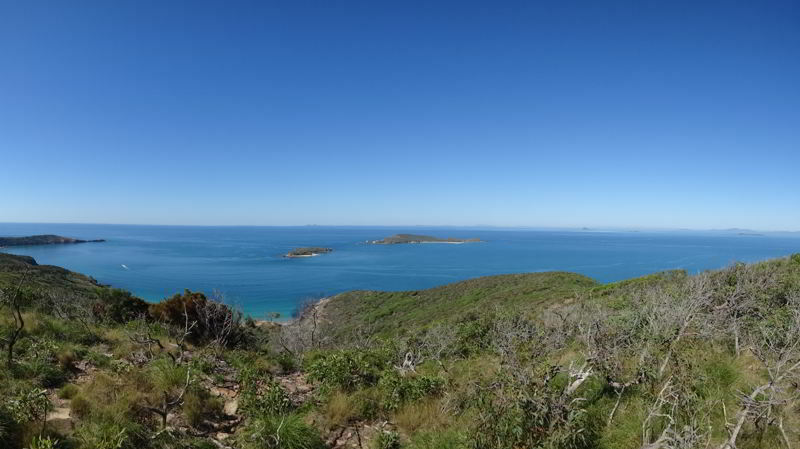 The first lookout is about 30 minutes walk with only the last 50 metres steep. There is a shelter and seats here. You get great views towards Fishermens Bay where we are anchored and we can easily see Catlypso. You can also see Second Beach on the north side and some of the bay off Svendsens Beach. There are a few yachts there. After a short break we decide to continue on. It only takes 15 minutes to get to the second lookout. This has great views to the south over Long Beach. We continue on. Lucky we started early as it is a warm day, about 27ºC. Veto is having a great time, exploring everywhere. She hears a goat and tries to run after it, but we call her and she reluctantly comes back. It takes another 35 minutes to get to Mount Wyndham. 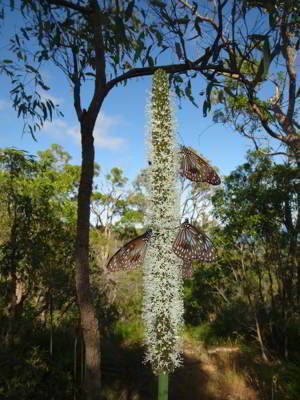 This is only 174 metres above sea level, but it has fantastic views to the south and east. We stop here for a while to recover, it is a fairly hard walk, especially in thongs. 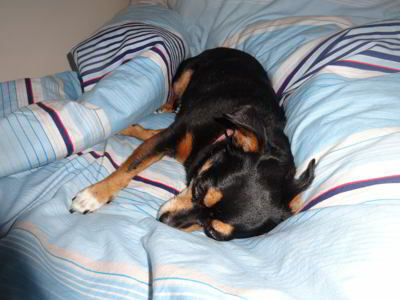 Veto is getting tired, as we have been walking for 80 minutes, well over her normal maximum at home. We head back down (which has a couple of upwards sections) and at one stage we have to carry Veto. She recovers a bit and walks the rest of the way back. We get back to the beach at 1210 and have a well earned swim. We drop into Amica and pick up the USB stick. We have lunch and a cold drink, magical! We read and rest, the two females on board both have a sleep. At 1500 we go to the beach for an ice cream. We drop by Rhythm and give them the USB stick so they can download the photos we took of them and upload some of Catlypso. 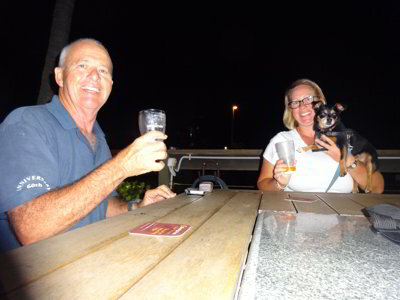 Russell and Carolyn are from New Zealand. We go to the GKI Hideaway Resort and buy ice creams, wow, they taste so good, it is well over a month since we had any ice cream. We come back to the boat and Michael has another swim and a cold shower. 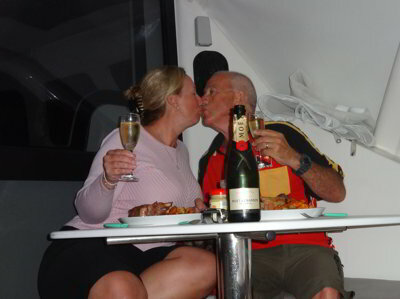 We read on the foredeck for a while and then have sundowners. Kelly makes spaghetti and meatballs. We go to bed at 2130. It was a bit sloppy overnight due to the southerly wind that is now blowing, but it was not uncomfortable. Today is our 10th Wedding Anniversary which is diamond and tin (apparently). Kelly gave me a drawing of a diamond on paper which was inside a tin can. Ha ha! Anyway, we get up at 0735 and Michael takes Veto to the beach. Back on Catlypso we have breakfast and then prepare for another walk. 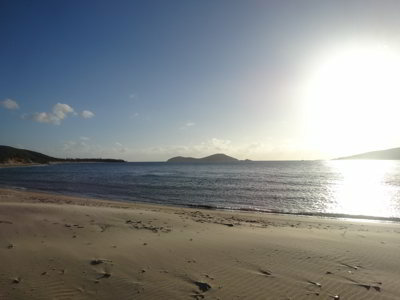 This time we are going to walk to Long Beach which is on the south side of the island. We go to Fishermens Beach and anchor a few metres out figuring that as the tide is not yet high, we should return to it in about the same relative position. We have trouble finding the start of the track. Michael asks a lady and she directs us to go through her neighbour's yard. As it turns out, the track starts in the creek bed at the southern end of the beach, follow the signs and then take the 4WD track to the right. 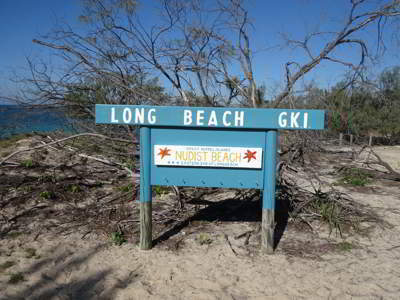 This is an easy walk, it takes us almost 30 minutes to get to Long Beach. On the way we can see glimpses of the airstrip. Turns out it is still in use as tomorrow we hear a plane land and take off from there. Just at the beach there is a sign proclaiming it as a nudist beach. You end up on the middle of the beach. The water is a beautiful blue, so we have a swim, as does Veto who then proceeds to roll in the sand! 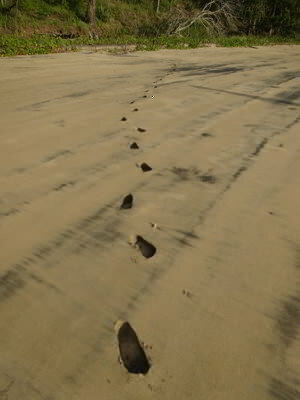 You can also get to Monkey Beach from right where the track hits Long Beach. We spend about 20 minutes here before walking back to Fishermens Beach. When we are back on Catlypso, we prepare for departure as we are moving the short distance to the northern side of the island to be protected from the southerly winds which will prevail over the coming days. We leave at 1040 and at 1125 we are anchored off Second Beach, near where we anchored in 2015. We are in 4.1 metres (under our keels) and it will go down 2.5 metres meaning we will end up with 1.6 metres at low. After lunch, we put the kayaks in the water and paddle to Second Beach and then Svendsens Beach. On Second Beach at the eastern end we discover a swing that we both have a go on. Kids! At Svendsens we see that there is still the small shelter and firepit and seats. We will come here for drinks, maybe tomorrow evening. Back on the boat we read on the foredeck before Michael takes Veto to the beach at 1630. He gets a it of water in T2 as there is a little swell breaking at times. While he is away, Kelly has a shower and then Michael does too. We put on our best gear (well, not really) as we are having a special dinner to celebrate our wedding anniversary. We have sundowners and then witness a fairly spectacular sunset. Kelly puts our dinner in the oven, a roast lamb rack with vegies. 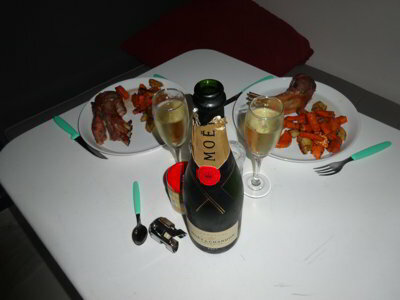 When the dinner is ready, we have it with a bottle of Moet and Chandon French champagne. What a great meal! Michael later watches Souths play Parramatta (via his phone app) but they play pathetic and lose. When we married, one of our vows was that we would purchase a yacht and sail the Pacific Ocean. At times it seemed that this goal was going to be too hard to achieve, but a lot of hard work and sacrifice meant we were able to do it, even a bit earlier than we first envisaged. It is hard to think of a better way to celebrate our 10th Wedding Anniversary than the way we did today! It was calm overnight and it is again sunny and warm. On the way to the beach Michael with Veto, Michael notices another Lightwave anchored off Leekes Beach. This is Hypnotic which has been for sale since before we bought Catlypso. Michael stops off and meets Pat the owner. He is on board with two mates. 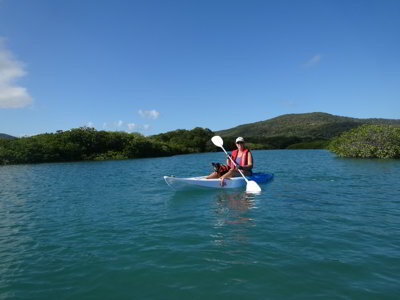 After breakfast, we paddle the kayaks to the lagoon behind Leekes Beach. As it is high tide, we can go into it. We paddle up a way before turning back to a spot we noticed. We then haul the kayaks up over the sand dune onto the top of the beach. 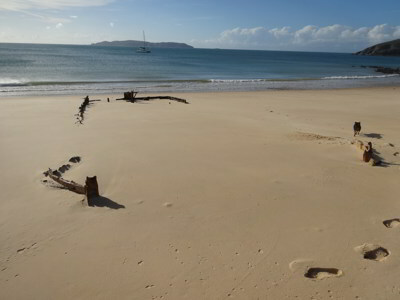 We leave them here and then walk to the middle of the beach where we find a four wheel drive track. This is the start of the track to the old homestead. We follow the track and 30 minutes later come to the homestead. You can also access the first lookout along this track by turning right at the first sign. Along the way we pass over a washed out causeway, a dam and the shearing shed (off to the left just before the homestead). 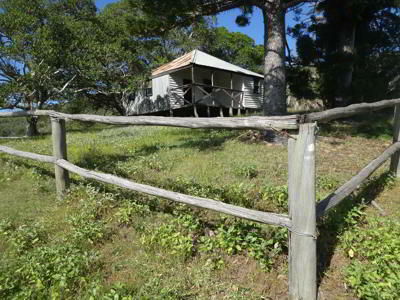 The homestead is a very simple iron and timber structure built in 1922-24 by Lizzie Leeke and her then husband. She ran sheep here till 1945. The homestead is on the Queensland heritage list. 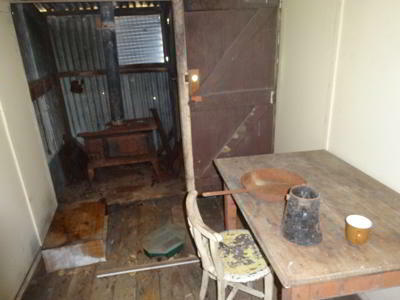 Although the access door at the back was locked, the door off the verandah was open. Inside it is still furnished, a fuel stove, a foot operated Singer sewing machine and more. Very simple. 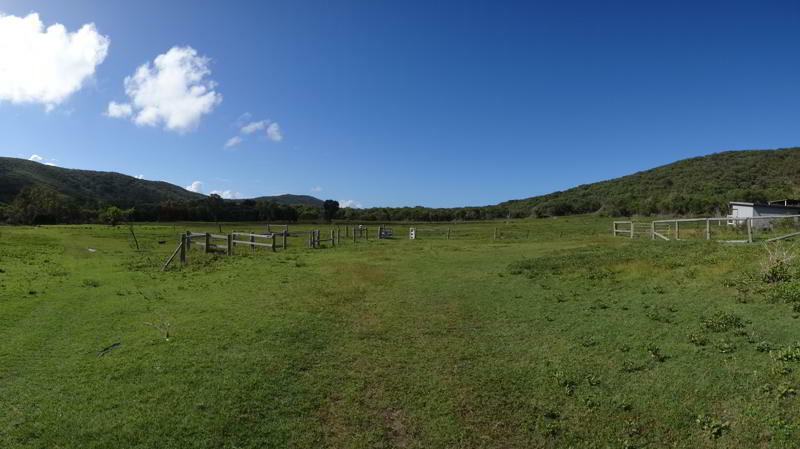 The land near the homestead is flat and green with lots of grass. There are hundreds of goats in the paddocks, not locked in as there are no gates. After a look around, we head back and soon encounter Pat from Hypnotic and his two mates. They are walking to a "lookout". I have no idea where this was, but they did not return for over four hours after we were back on Catlypso. We guess that perhaps they went to the lighthouse. We walk back to the kayaks and have a refreshing swim. The past three days we have done lots of exercise that is for sure. We paddle back to the yacht and then have lunch. After this we fixed the sail bag which was not holding the mainsail properly. Michael also added 14 litres of diesel to the main tank which is now full. We then drop the screecher and work out how to take it off the prodder (the bow sprit). We are trying to work out how to remove the furling line. Try as we may, we cannot remove it, so it looks like we will not be getting a new line as it also has to go through the jammer. We will speak again to the rope man on Monday to see if he can make the line on site. Michael then decided to wash the two filters for the watermaker. He got the first one out and when he used the deck wash to wash it, the pressure blew it out of his hands and over the side into the water. Bugger! He asks Kelly to get his mask for him. Well, she does, but then she falls into the bilge where Michael got the filter from and neglected to put the floor back in place. Luckily she has not hurt herself, but she will have a bruise or two. Michael jumps in the water and swims down the couple of metres and finds the filter about three metres from the back of the boat. He then washes it carefully. He gets the next filter (the 10 micron one) and the dirt that comes from this is unbelieveable. He has put the other one in the container and will dry this one and use it next time the filter needs cleaning. We go to shore (it is 1630) and Veto has a run. However there are lots of other dogs here, all bigger than her, and she gets scared so we have to hold her. We go to the shelter area and meet some of the other yachties here. We are not drinking tonight, so we do not stay long, heading back before dark. We have some nibblies and then Michael cooks some sausages to go with the leftover lamb rack and a small salad Kelly makes. A simple but nice dinner. We read, write up the blog and answer emails. We are in bed as usual by about 2100. It was a quiet and calm night. We got up at 0720 and Michael as usual took Veto to the beach. After breakfast, we paddle to Svendsens Beach and then walk to Butterfish Beach. 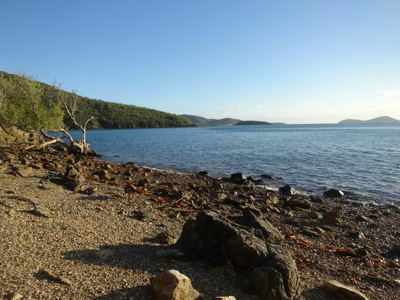 Michael neglects to take his thongs, so he has to walk slow as the track over the headland is quite rocky. It is not too bad, but it slows us down a little. We walk along Butterfish Beach and at the other end we take the track to Wreck Beach. This is through sand dunes so is much easier on his feet! It takes 50 minutes to get to Wreck. We sit on the beach, it is much, much calmer here than when we walked here in 2015. After 15 minutes we walk back to Butterfish. There is a huge sand dune to the north-east of the track and we go to the top for the view. There are eight younger people here off two boats anchored below. We sit and watch the view for a while before heading down. Veto is funny to watch as she slides down the very steep sand dune. We return back to Svendsens Beach. 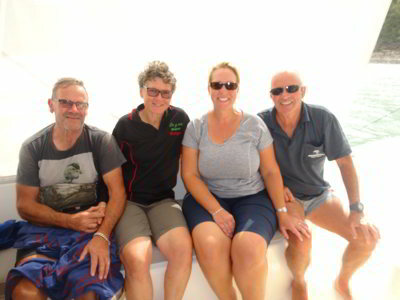 At the kayaks, we are approached by a French couple who have sailed their aluminium monohull here from France. They ask about the Shoalwater Bay Army Training Area and are the anchorages open. We assure them that they are all open and that no other closures are in place now (there were till two days ago). We have a swim to cool down and then paddle back to Catlypso. We have lunch and then read and listen to the VHF, there are dozens and dozens of logons and logoffs while we listen and at least four boats they have to recover from situations like stranded on sand, taking on water and engines not working. Far busier than we are at Marine Rescue in Sydney. We put the kayaks away and then Michael tries the generator again to see if he can heat the port hot water heater. No go, it seems it is still not connected. He will have to look at the wiriing again. We then took Veto to the beach for a run and spoke to Jarod from Brahminy. 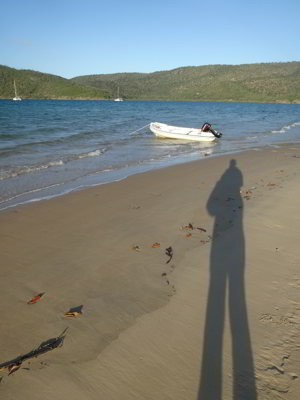 At 1645 we go to Svendsens Beach to have sundowners. We start a fire in the firepit and have a couple of beers sitting around the fire. No other boats end up coming in, but Carl Svendsen who owns the property here comes down and we talk to him for an hour or so. It was good to speak to him again. 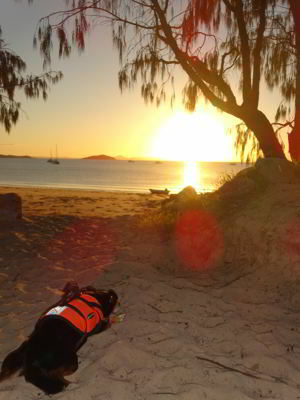 Veto is exhausted, all the walking of the past four days appears to have caught up with her, she just lies on the sand. We are back on the yacht by 1835 and Kelly heats up some lasagne that we froze a few weeks ago. We go to bed about 2100. Yet another calm night, we get up at 0710 and while Michael takes Veto to the beach, Kelly makes breakfast. We leave at 0805 and once away from the anchorage, we pull out the screecher and sail at about 5.5 to 6.5 knots in a 12 to 17 knot southerly (beam). 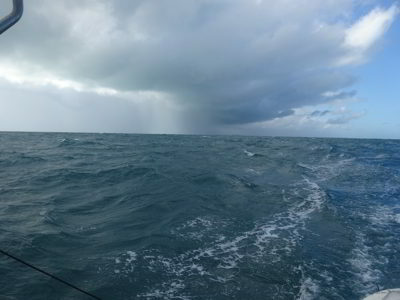 The seas are flat and it is a nice sail till about half way across, the wind drops to under 8 knots. We now have to motor and closer to the mainland the wind drops to 4 knots. We motor into Rosslyn Bay Marina and into our berth at 1010. Trish and Lance from Euphoria help us moor. Kelly goes to pay ($64, cheap) and book the courtesy car for 1230. While Michael take Veto to the land and disposes of some rubbish, Kelly puts on two loads of washing. We decided to have lunch at the marina, but as you cannot order till 1130, we had to sit around for quite a while till we could place our order. The two loads of washing were finished by the time we completed our lunch, so we took it back to the boat and left Veto there. She was not happy at all, howling and crying as we left. We drove to Yeppoon, once again we had to do a long detour as the coastal road is closed, presumably because it has collapsed or being impacted by a landslide. This is the same as 2015, talk about slow repairs. We have to shop for the next almost five weeks, with one week having four on board and tone with three. Michael drops off Kelly at Woolworths, but checks the liquor store next door and finds the beer he wants cheaper than BWS. 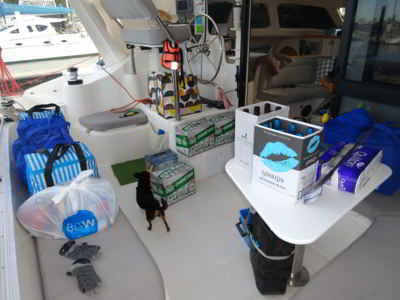 He purchases three cartons but there is a poor selection of wine. He goes to the BWS but again, this has a poor selection and he only gets six bottles of red. On the way back he notices a large liquor warehouse (Star) which is the same as the one near Woolworths. This has a lot more, so he gets sparkling and white wine here. From here he goes to Bunnings and gets a new tape measure (the old one broke), some Sikaflex and some rubber sealing strip (see in a few days about this). He then goes to BCF to look for some gloves for kayaking but the only ones are $35 a pair. He then goes to Supacheap Auto and finds some at $2 each which may be okay, he gets four pairs. He heads back to Woolworths and Kelly is almost finished. We go back to the marina and unload. It takes three trips to get everything back to the boat. Kelly then starts putting all the food away while Michael heads off to get fuel. He uses the marina's trolley and walks to the petrol station and fills two containers. His next trip has another diesel container and three small petrol containers. Once he is back, he puts all the containers away. Michael then turns the freezers down to freeze all the new things Kelly has put them down. Might as well use shore power to do this! After this we go and have showers. What a luxury to be able to spend more than a minute or two under hot water. When we are finished, Kelly puts on another load of washing so our towels are also done. 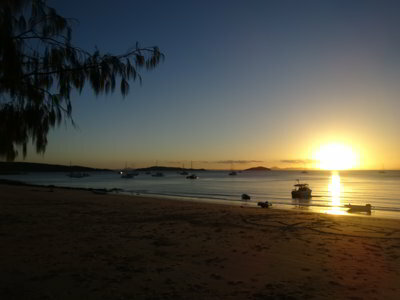 We then walk over to the Capricornia Cruising Yacht Club which is open from 1200 to 1900 each day (2200 on Fridays). We order some beers and sit outside in the beer garden with Veto. We order some pizzas from a local shop (Rosscos) who we know will deliver here. We have another beer or two and the pizzas turn up, quite nice they are too (we got two so we could freeze the remainder for another day). 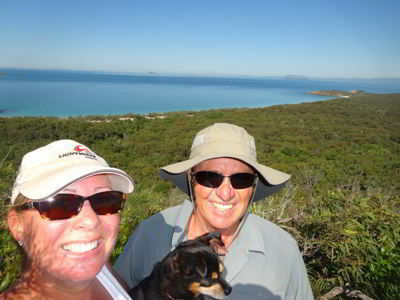 We also speak to Trevor and Judy from Roma who we have seen at Burnett Heads, LMI and Pancake Creek. Like us they are going to Pearl Bay tomorrow. We walk back at 1900 when the club closes and Kelly puts the washing into the dryer. Later we walk up with Veto and collect it all. We end up going to bed at 2230. We end up getting up at 0600 as we rethought our departure time during the night. 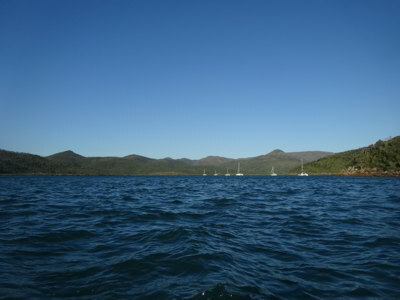 It is about 45 nautical miles to Pearl Bay and at five knots it will take nine hours. Therefore we need to leave at 0700 to get there by 1600. Michael takes Veto for a walk in the marina while getting rid of some rubbish. When he gets back, we fill the port water tank and also flush the watermaker. Kelly also washes the anchor chain and deck. We leave at 0705. Kelly logs on with the coast guard and we pull out the screecher. However, it is not giving us anything as we only have 7 knots of wind behind us. We motor sail at 4.8 knots into a 0.5 knot current. At 0805 the wind goes south east and up to 15 knots, we increase our speed to 5.7 knots but within a few minutes it drops back lower. Later we have 13 knots and with an engine, we do about 5.2 to 5.5 knots into a 1.5 knot current. It is quite sloppy, mostly because of the wind against current. We pass Roma just before Cape Manifold and speak to them again on the VHF. 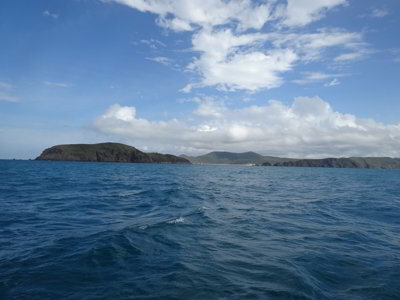 Once we round Cape Manifold (and the “no name” island off it) we go into much calmer waters and the current drops off. We turn off our engine and sail at 4.5 to 5.5 knots. At 1415 we pass the entrance to Port Clinton and near here we have to start an engine again as the wind drops back to 9 knots. 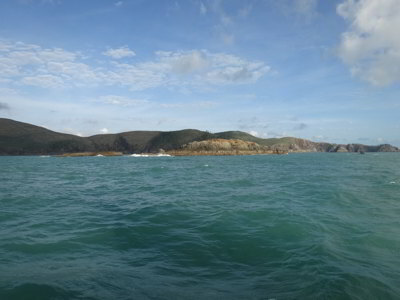 As we approach the southern entrance to Pearl Bay, we pass inside Delcomyn Island but make sure we go outside the “bare rock” marked in Lucas’s guide as in 2015 we met someone who went between it and the shore and did a considerable amount of damage to their keel. We pull in the screecher as we pass the bare rock and then motor into Pearl Bay. At the entrance the waves are standing up steeply and the current running out is about 2 knots. Once inside it is very calm. We motor past the “three shoals” shown on our chart, they do not exist as far as I can see and people are already anchored right on top of them. We anchor at 1555 near where we anchored two years ago. Once we are sure we are not moving, we take Veto to the beach for a walk. We cover the whole length of the beach before returning back to Catlypso. While on the beach, Roma comes in and anchors next to us. We have showers and then sundowners. Kelly cooks tacos for dinner. We read and go to bed at 2100. It was very calm overnight, with only a slight bit of rolling for a short time. We get up at 0625 and Michael takes Veto to the beach while Kelly makes tea and coffee. Two of the yachts anchored here last night have gone (Outahia and a mono) but Roma and Margay are still here. We leave at 0700 and take the inside passage between the islands and the mainland. We pull out the screecher and in 11 to 15 knots we make 4 to 5 knots (we have a current against us). At 0725 the wind went more southerly so we had to swap the screecher to the starboard side, but we dropped to under 3 knots. We had to turn an engine on to make any sort of speed. As we pass Brown Rock (outside it) we swap to the genoa and then turn into the entrance to Island Head Creek. We take the southern entrance and we have plenty of depth till we stray a bit too far towards the sand bank (1.5 metre under keel). We come back a bit south to deeper water, minimum of about 3.0 under our keels about an hour after low. We pull in the genoa and motor up the creek. Make sure you keep closer to the beaches and rocks on the southern side. The wind increases to over 20 knots as we come up the creek. 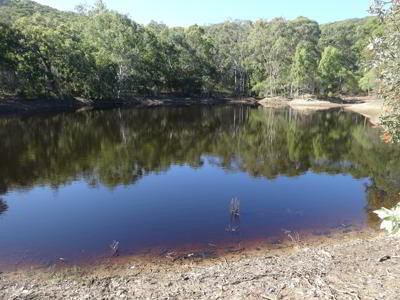 We are going to look at the second bay/creek on the western side. 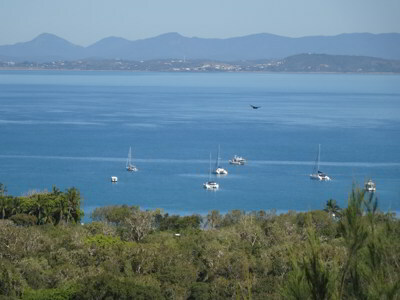 There are two yachts in the first bay, we tried there two years ago but it was too shallow on the tide we tried. We know that Amica and Rhythm are anchored there as we can see them on our AIS. The charts are wrong here as well (as they are for the entrance), the deeper water is shown as being in the middle but really it is on the northern side. We stick close to the rocks on the northern side and the depth goes from 24 to 18 to 4 metres once inside. We motor towards Amica and try to go around her stern, but the depth goes to 0.2 metres under our keels, so we reverse and stir up the bottom! We decide to anchor to the east of them and drop anchor in 1.8 metres knowing that we will hang back into deeper water with the southerlies forecast. We will probably be here for the next four or five days due to very strong (25 knot) southerlies. We end up in 4.5 metres (with about 1.2 metres to drop). Soon after we anchor, a mono hull called Halycon comes in and follows their chartplotter and runs aground. Michael calls them on the VHF offering to come over with the dinghy to assist but as the tide is coming in, they say they should be okay. They eventually get off, perhaps 20 minutes later. They come in via the correct channel, but decide it is too shallow for them and go out to the main channel to anchor. 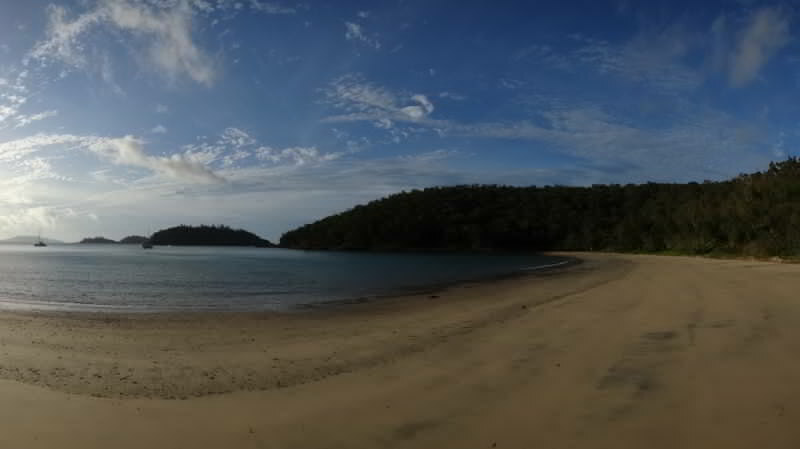 A panoramic photograph of our anchorage at Island Head Creek. We are the yacht at the left. Soon after Roma and Margay come in and after discussions with Michael and Rhythm, they come in and anchor to the west of us. Trevor and Judy from Roma invite us over for afternoon tea. Kelly decides to cook a mixed berry slice to take over. Michael installs the rubber strip he purchased to try to stop rainwater and dew from running down onto the cockpit seat area. He also puts some on the cockpit roof to stop water running off there into the cockpit and on the helm roof. We then have lunch. After lunch we went for a run in Thunderbird 2 to the west up the creek, but it got too rough, the wind is between 15 and 20 knots. We take Veto to a rocky beach to the north-west of us. Not a great spot, Michael cuts his foot on a bit of oyster, not bad, but a tiny piece is in his heel. Later Ilakia (?) 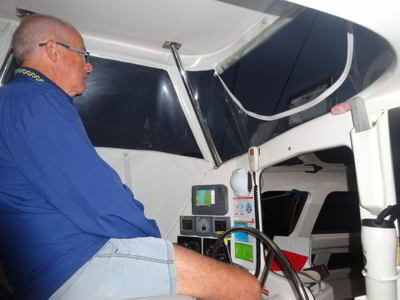 came in and Michael again warns of the shallow water as they are also using the channel shown on their chartplotter. They safely end up anchoring near Rhythm. Later Richard and Suannah from Ilakai call to thank us. Turns out they used to own Ultimate Dream which was the first Lightwave we ever saw. This was when it was owned by Kevin and Paddy and we spent part of New Year’s Eve in 2005 (I think) on it. Small world! Michael also relayed to Coast Guard Keppel Sands a logoff request from Felix anchored at Pearl Bay. He could not contact them on VHF 21 but we could. At 1500 we go over to Roma for afternoon tea. We have pikelets cooked by Judy as well as Kelly’s berry slice. We spend about 90 minutes there, an interesting time. On the way back we take Veto to the rocky beach nearest us as the wind has dropped to 10 knots or so. 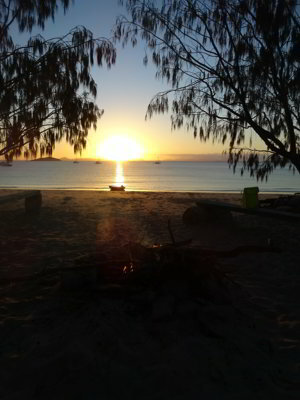 We then have showers, sundowners and Kelly cooks peanut chilli beef and noodles. We read and then listen to the first State of Origin rugby league match between NSW and Queensland via the HF radio. The wind has died right off, it is supposed to be over 20 knots tonight but so far it has been under 10 since 1600. However, there are hundreds of little bugs that came inside while we were having dinner, we spray them and they end up all over the place. 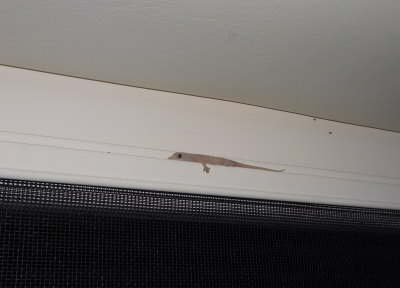 Kelly also found another gecko, this one in the shower recess. This is the fourth one we think. NSW end up killing Queensland, well, at least as far as the usual results go. 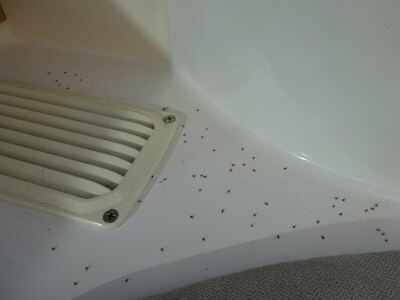 We have to spray the whole boat four or five times to kill all the bugs. We go to bed at 2300. We get up at 0800. It was fairly calm overnight despite winds of over 20 knots at times. The wind is now from the south and we are protected here to a certain extent. It is relatively calm now. There are dead bugs everywhere. Kelly starts cleaning up the bugs. It takes a long time to get them all (in fact some are found four days later). Meanwhile, Michael takes Veto to the shore for her usual wee and poo and run. He first tries what are shown as sand flats on our guide book, but in fact they are mud and he sinks to over his ankle when trying to land. He ends up going to the beach to the north of us. Since the tide and wind have changed, we are hanging back towards the rocks on the nearest point. This looks very close, but our golf rangefinder shows that it is 51 metres away. 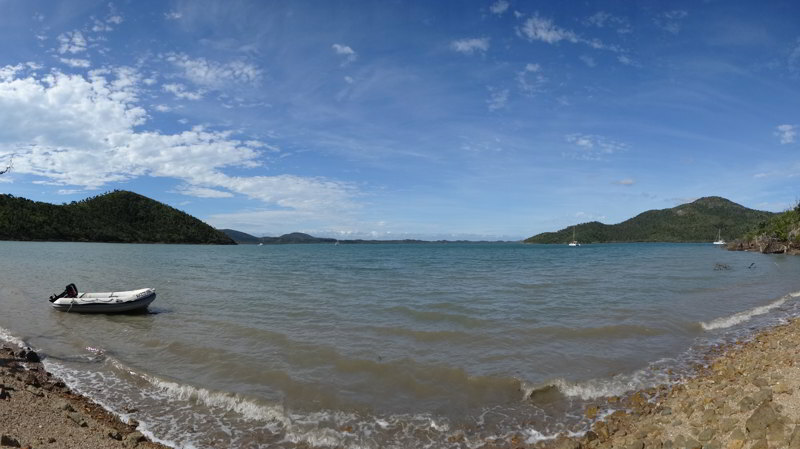 A panoramic photograph of the southern-most anchorage at Island Head Creek. At 0920 we decide to go for a run in Thunderbird 2 further south along Island Head Creek towards the third anchorage shown in our Lucas guide book. There is still a bit of wind, perhaps 15 knots at the worst. By keeping to the western side of the main channel we are fairly protected. It takes 12 minutes to get there running almost flat out. In this creek/bay there are two boats, both professional fishing boats. They are tied together and the crew is out on a smaller tinny that we have seen yesterday and this morning. They probably are after crabs and perhaps prawns. This is a protected spot as well, but not as deep. It would be not too bad a spot to be anchored in winds like we have. On the way back we run via the eastern side of the channel to see if the exposed land is sand. Unfortunately it is mud, so we keep going. We stop at Halycon, the yacht that ran aground on the sand yesterday. They are anchored in the main channel. We are invited aboard by Werner and Liz for morning tea. It is a very nice monohull, 45 foot and very wide. They purchased it two and a half months ago. We end up chatting for a long time as we do not get back to Catlypso till just after noon. The wind is now back up to 17 plus knots in the open. We have lunch and then Kelly removes the remaining little bit of water from the port bow and seals it back up. Hopefully we have now fixed this leak. Michael transfers 45 litres of desalinated water from two containers to the water tank we are using. He then decides to accurately measure how much water they will hold. He figures out where the nominal 20 litre mark is and then fills them with more water. He can get 23.5 litres in each container. He marks the three containers in five litre increments and then one litre marks from the 20 litre level. This will help work out how much water we are making. Kelly then starts removing silicon from around the bottom of the cockpit roof arch support and then between the arch and the underside of the roof. This is all very old, probably original, and has started to break up. 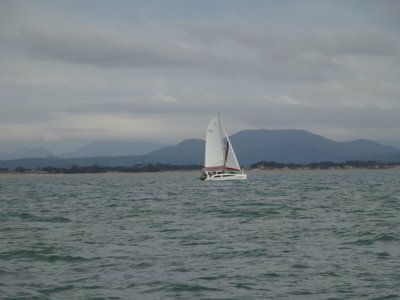 We then hear a radio check from Pacific High which was anchored near us at Great Keppel. Michael answers them. Turns out they are about level with us. Michael turns on our laptop and we can see them via AIS. As they enter our anchorage, Michael warns that they are coming right in over the sand back where Halycon stranded yesterday but they do not change to his suggest track. Luckily the tide is much higher now, so they clear it. They anchor between Mica and Roma. At 1550 we put the generator on so we can make rice and then take Veto to the beach. It is now very windy, 17 to 20 knots south-easterly. We decide to have a non-alcohol day, so no sundowners. We have garlic bread, chicken and leek and rice. We sat inside from sunset with the door closed to stop a repeat of last night’s bug problem. It is a bit bumpy from 1800 for an hour or two. We go to bed at 2100. It was calm till 0400 when the tide changed and it became quite rocky. This lasted till 0530. At 0630 it started raining, constant but relatively lightly. We get up at 0800. The rubber channels Michael put in to stop rainwater (and heavy dew) running onto the seat areas appears to have worked. The wind during the night hit over 30 knots according to our wind instrument. Michael takes Veto to the beach to the north-west of us. Bad move! The wind is very strong and as the tide is much lower today, he gets stuck there and has to use the small boat hook to push T2 out far enough to drop the engine. Once he gets going, he hits bottom a number of times. We will not be going back there at anything but highish tide. We have breakfast and Michael makes a new batch of yoghurt. This is using a EasiYo container. All he does is save about three or four spoon fulls of yoghurt, cleans the container, adds one and a half cups of powdered milk, water to dissolve it, then add the old yoghurt and top up with water. Leaving it 12 hours in the container heated by boiling water gives Greek style yoghurt. We have this most mornings with our muesli. It is a very overcast day with the wind 12 to 15 knots. We read and then Michael attempts to get the AIS to be able to be used by both our applications on the laptop. No success. He then tries to get it able to be accessed via Bluetooth or Wi-Fi to our tablet which runs OpenCPN and Google Earth photos. Again, no luck. On the way he somehow stuffs the Wi-Fi router we sometimes use to access the internet (and for printing). He has to find the old Cat5 network cable to connect the laptop to it and fix it up. All good again. Meanwhile Kelly returns to her work from yesterday removing the silicon from the join between the cockpit roof and the arch. 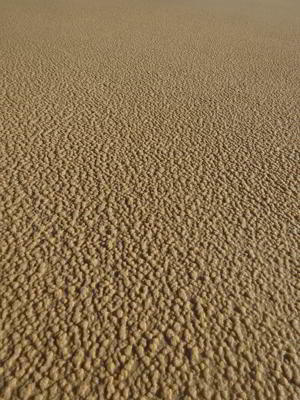 Some water comes out of one spot, this appears to be the last of it. At 1230 we get a call from Roma. Judy has collapsed on the toilet and Trevor is asking for medical help. Liz from Halycon replies that she is a nurse. By now it seems Judy has recovered somewhat. Turns out she had bad lower stomach pains. She recovers her colour and seems much better. Sounds like a stomach bug or food poisoning (but Trevor is okay and they have eaten the same things). We check later and she seems to be over it. Not a nice thing to happen, scared us all a lot. Liz ends up telling us that they had a bad night as they had a lot of flapping noises and movement and were worried they were going to drag anchor. They have not slept much since 0130 and are going to bed now. After lunch Kelly did some polishing of the rear steps to remove some stains while Michael attempted to set up the laptop to receive weather faxes from the HF radio. Despite setting the software up and plugging the HF radio into the laptop, all he got during the afternoon was rubbish. Looks like more experimenting is needed. 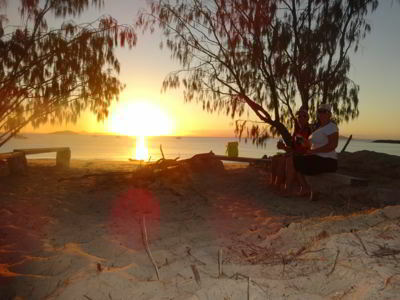 We took Veto to the closest beach and then had sundowners. Kelly made rissoles and salad for dinner which we again eat inside. The wind is now only 10 knots, but it hit 30 knots lots of times during the afternoon. Kelly later writes up our expenses in her spreadsheet, she has not done this yet this trip. There was a little rolling from 1900 to 2000 but then calm. We go to be at 2100. A very calm night, the wind was less than 12 knots till about 0400 when it went to 15 to 17 knots and from 0600 when the tide changed we had a bit of a roll for an hour. We get up at 0710 and Michael takes Veto for a run. As the wind has dropped, he heads out into the main channel and then north towards the first anchorage spot. There is a small rocky beach that we saw on the way in just around the headland and it is absolutely calm here. Michael and Veto land there and she has a little run. After this he heads into the anchorage. As it is just after high tide, he can cut across the shallow areas. 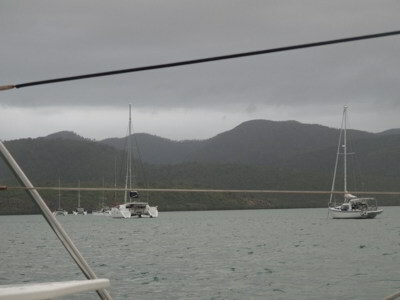 The two catamarans that were there on Wednesday when we came in are still there. The fishers tinny is also there, pulling up their crab pots. After breakfast we speak to Judy who says she is feeling much better and she is going to have some breakfast. Trevor is out checking his pots. We invite them over for morning tea. Later Trevor comes over and says that Judy wants to relax a bit more, so we make the invite for tomorrow morning. We discuss a few things and talk about watermakers, water capacity (they have over 700 litres and a watermaker but have never used it) and more. After Trevor leaves, Kelly does some more work on the silicon joins and gets them ready to be filled in. Michael glues some of the LED strips he put into the boat’s lights back in place as the adhesive on them has failed after three years. We have lunch and then Kelly makes a green chicken curry for tonight using the leftover roast chicken. We get enough for a feed for Veto too. It is sunny today, unlike yesterday, so our batteries are topping back up. The forecast is still for 20 to 25 knot winds for tomorrow but it looks like Monday will be okay to leave as they will be 15 to 20 knots. The wind now is still up around the 20 to 27 knot mark. 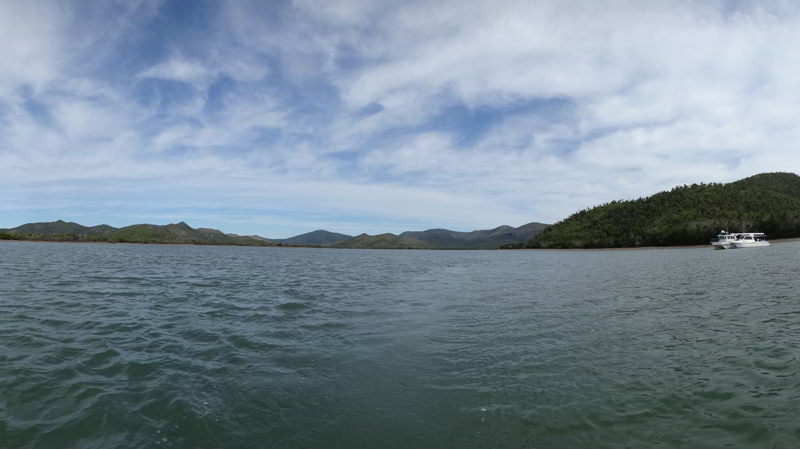 At 1420 we headed off around the headland as the wind has dropped to 8 knots, with the aim to go to the sandy beach near where we anchored in 2015. However it is a bit too windy so we just go to the rocky beach that looks back towards the entrance. We come back for afternoon tea and then we start the starboard engine to heat up water for a hot shower. Michael takes Veto for a run up the creek in Thunderbird 2 in an attempt to find another beach for her. He fails, but sees Trevor and Judy out checking their crab pots. While he was away, Kelly used the power from the engine to make rice. We have showers, very welcome after three days, and then have sundowners. We have a great green chicken curry and rice dinner and then go to bed early again. It was calm again overnight apart from the short time after 0500 when the wind picked up a bit and the tide changed. We got up at 0705 and as it was so calm again, we both took Veto for a run to the north to a proper beach. This meant going out to the main channel and then heading north to the first anchorage and to the beach located on its northern side. We anchored Thunderbird 2 just on the edge of the beach and went ashore. 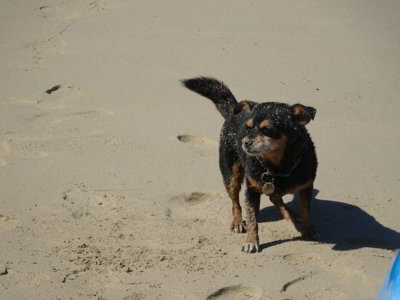 Veto was the happiest dog you would ever see, running around in the sand. She has not been on a proper beach for five days. She had a great time. 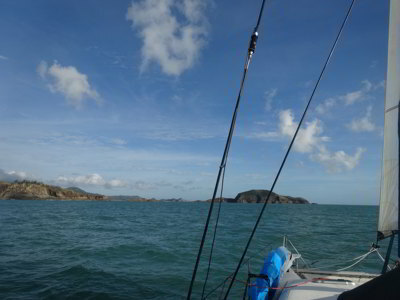 The wind had picked up a little for our return trip (into the southerly). This morning four of the yachts in our anchorage left, some for the Percy Islands and others for Hunter Island (we think). Another yacht anchored in the channel also left. Once back, we had breakfast. We had already organised with Roma for them to come over for morning tea at 1030. Kelly calls up Ilakai to invite them and also tries Halcyon but they do not answer. Michael goes over in T2 and asks them to come as well. After they leave, we end up having lunch and then restart work on the silicon joins around the cockpit roof and supports. Kelly tapes up the joints so that the new silicon will look neat. Richard and Werner come back and Michael copies the data off our laptops for them. Michael then silicons the joints with Kelly’s help. 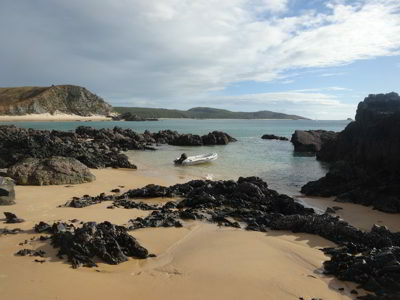 We then take Veto to the rocky beach around the headland. By the time we get back it is time for sundowners. We have these in the cockpit as usual but soon move inside to avoid the bug plague. Kelly then cooks blade steak schnitzel (she thought she took out veal) and potato mash. This was excellent. 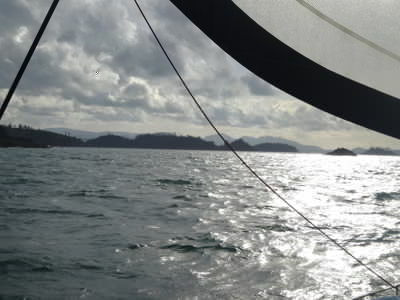 We read, Michael again writes up this blog and he also creates a route for tomorrow’s sail on the chartplotter. We go to bed at 2100 as we are getting up at 0530 for a 0600 departure. Once more, a very calm night. We get up at 0530 and prepare the boat for departure. The forecast is for 15 to 20 knot winds, so we should have a good run. Kelly makes tea and coffee and then once it is light enough, Michael takes Veto to the shore. We put Thunderbird 2 back on the davits and at 0605 we are under way. 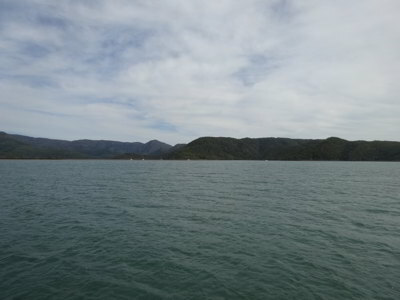 We motor out of our anchorage and as we do, we see on AIS and visually that lots of other boats are leaving as well. We are the first in line, we have a convoy! There are eight other boats behind us. Once out of Island Head Creek, we turn on the line to South Percy Island and pull out the screecher. We are doing 5.5 to 6.5 knots in 12 to 20 knots of southerly wind. We turn off the engines. Soon we hear that Halycon has problems with their engine and they anchor near our anchorage. They have an overheating alarm. Later we hear that they had an airlock in the raw water line. They will now leave tomorrow. As well as us, there is Roma, Norseman and Madiba. We log on with Bill at Coast Guard Thirsty Sounds for the trip. We put the watermaker on at 0930 to refill our tanks. 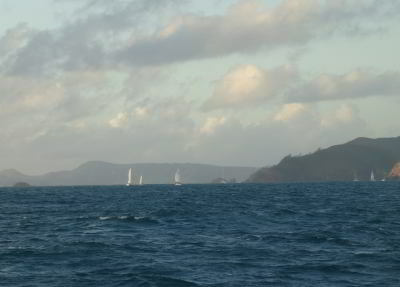 At 1015 we pass Steep Island, the wind is still similar to before and we are doing 6.4 knots into a one knot current. So far the seas have been very comfortable, a largish swell but not much chop. Soon after this we have a few rain squalls. The wind goes to over 30 knots (the instrument later shows a maximum of over 36 knots) before dropping right back once the rain starts. We pulled in the screecher before this in anticipation of much stronger winds and swapped to the genoa. The wind changes direction a bit after this and we have to swap the genoa to the port side. Once all the rain is gone, we go back to the screecher. The wind again changes direction and we have to pull the screecher in. The furling line slips and we end up with about three metres of sail out. For the last third of the trip the seas are very uncomfortable, with at least two metres and sometimes up to three metre waves. We decide not to put out the genoa (or the screecher) and motor the last hour. We round Chase Point, the north-eastern point of South Percy Island and are back in calm water again. 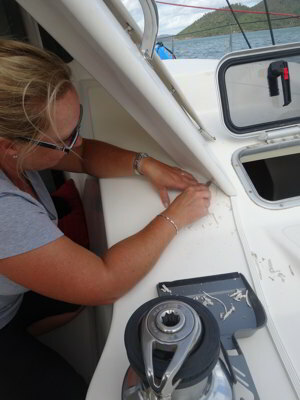 First thing we do is log off with Thirsty Sounds, then drop the screecher to the foredeck and secure it. 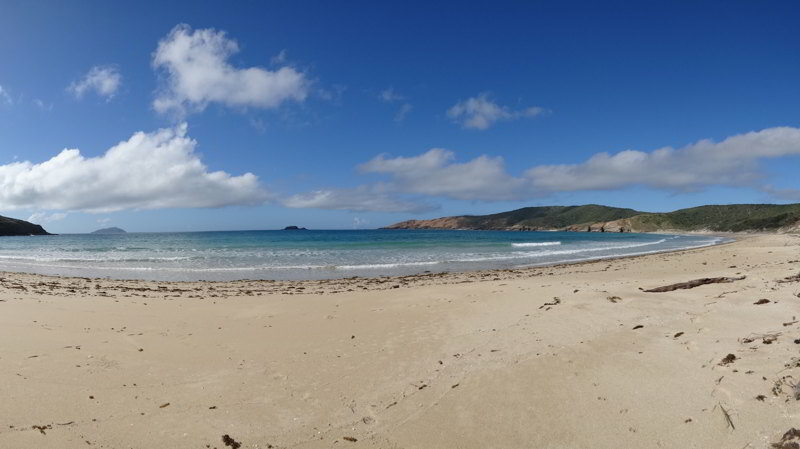 We motor towards the beach and end up anchoring in about 3.5 metres off the centre of the first beach to the east of Four Heads. This is about 100 metres from where we anchored in 2015. Tiara is already here, it powered by us way back as it had its spinnaker out. Norseman came in about 45 minutes later. While we wait to check that we are properly anchored (wind is still over 20 knots), Michael transfers all the water he made into the starboard rear water tank (70 litres from containers, another 20 litres went in direct). We decide to go for a walk, so we motor in Thunderbird 2 to the beach. However, it is breaking, so we go over to the “harbour” we discovered last time on the eastern side of the rocks to the west of us. 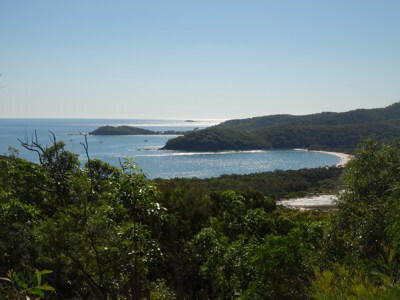 This little protected area is accessible at any tide and in most conditions. You can anchor in its protection without any worries. Over the next 50 minutes we walk to the eastern end of the eastern-most beaches and then to the western end of the other beach. Veto has such a great time, she has not really had a good run for six days. She rolls in the sand many times and seems very happy. 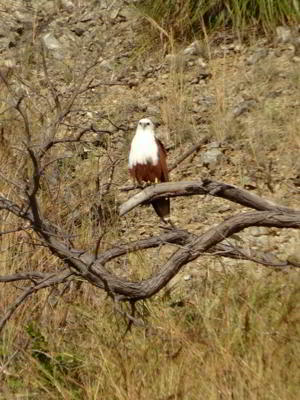 We see two large sea eagles in a tree above one beach. 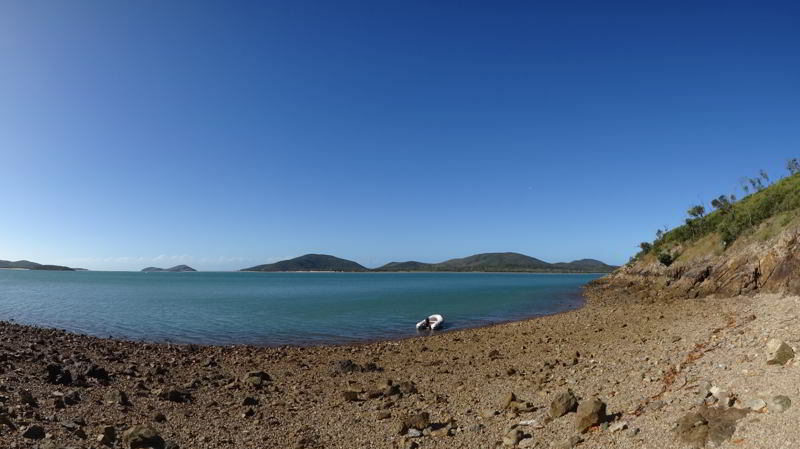 The small barge like shipwreck that we could just see two years ago is much more visible this year after Cyclone Debbie hit the area a few months ago. Once back on Catlypso we have showers and listen to the excellent weather report from Bill at Coast Guard Thirsty Sounds. 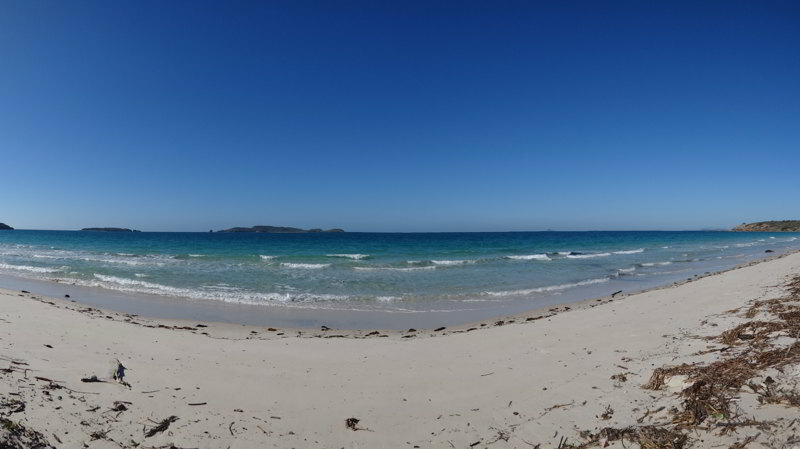 This is the best presented report we have heard for a week, the Yeppoon/Keppel Sands ones have been very poor, only summaries and only for the area south of the Keppel Islands. Kelly calls Bill to thank him for the good report. It is also good weather-wise, at least for the next three or four days. 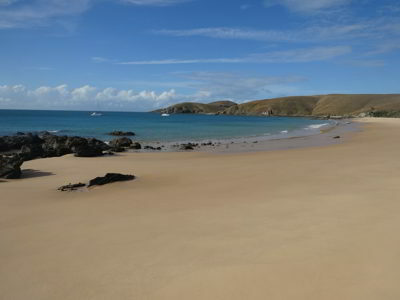 We will go to Middle Percy Island tomorrow and then Scawfell Island the next day. We may be stuck there for a few days after that it seems. Around this time Peter from Norseman calls and comes over. He wants some chart and Google Earth files Michael has, so these are copied to his hard drive. Around this time the wind picks up from 15 to a constant 28 knots. It stays that way for over an hour and eventually drops back to 8 knots before returning to 15 to 17 knots. Much more comfortable. 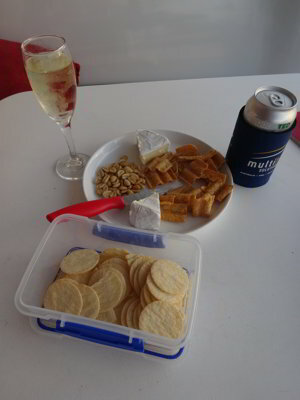 After he goes, Michael makes dinner, creamy pasta, and we have sundowners. It is very cold so we go inside. It also rains a little. After dinner Michael copies the chart data to his external hard drive so that tomorrow he can load it onto Kelly’s laptop. Kelly does some route planning for the coming days. By 1825 the wind has dropped to 8 knots, but later it goes back to a more consistent 12 to 15 knots. We read and go to bed at 2100.